The same proven educational and instructional techniques as in the Deluxe version but with more child friendly, age appropriate context and graphics. For 7-12 year-olds who want to take a fun filled, learn to type adventure to Typer Island. Literally hundreds of lessons, tests and games to keep everyone entertained and motivated. Visit The Old West, The Castle, plunge Under the Sea and play On The Water and In The Air. 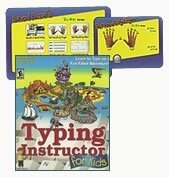 Kids will love this award winning program and be amazed at how quickly and painlessly they develop typing skills. Multi-user and site license available. Please call information. Windows compatible only.